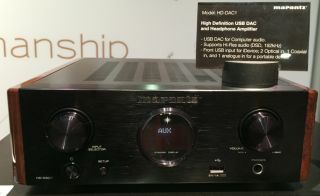 Marantz USB DAC and headphone amp makes its US debut | What Hi-Fi? Spotted on the Marantz stand at CEDIA Expo 2014 was the HD-DAC1 which is due on sale in North America in the next month or two for around $800. It has a classic Marantz look with smart wooden side panels and trademark circular display. The unit supports high-resolution audio formats including DSD (Direct Stream Digital) and 24-bit/192kHz. On the front panel there's a USB input for connecting Apple iPhones, iPod and iPads, a headphone socket, volume control and input selector. Round the back you'll find two optical inputs, one coaxial input and one analogue one. There are also fixed and variable line outs. Sister company Denon was also showing off its less retro-looking DA-300USB DAC/headphone amp, which we reviewed back in May, on the same stand.